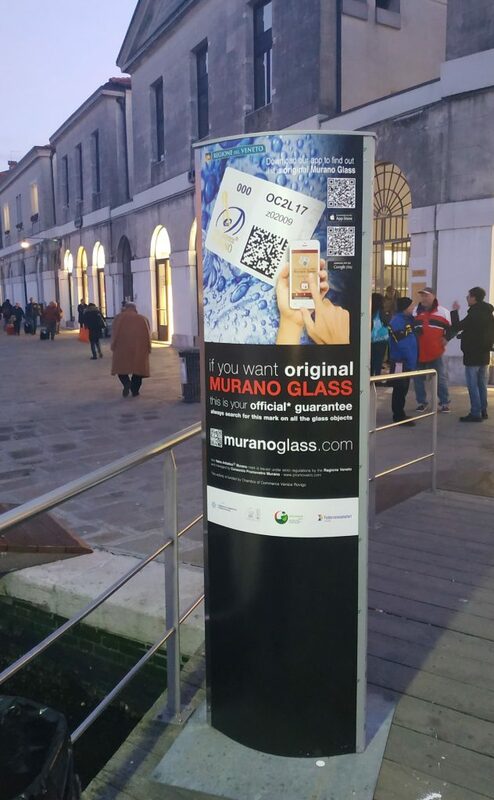 After the advertising campaign realized in 2017, the new one has the aim of spreading the traceability project and promoting the Vetro Artistico® Murano trademark in the local area. The initiative is funded by the Chamber of Commerce of Venice and Rovigo and aims to strengthen the presence of the Vetro Artistico® Murano trademark in the local area, giving continuity to the activities carried out in recent years and in particular to the campaign realized in 2017 in collaboration with the Regione del Veneto and the consumer associations Adiconsum and Federconsumatori. The promotional plan involves the water-based public transport services and is accompanied by the positioning of posters and totems at the most strategic points of Venice in order to intercept the greatest number of visitors and tourists. 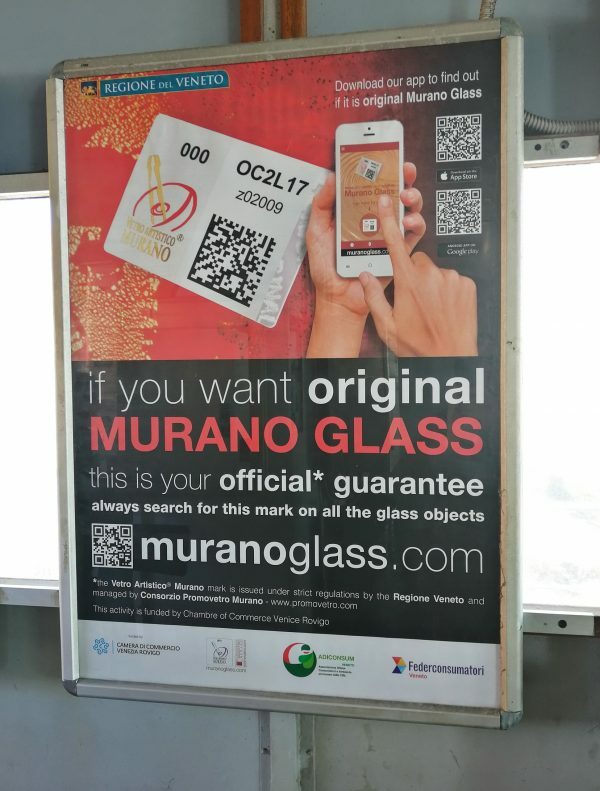 The advertising campaign starts in conjunction with the implementation and improvement of the traceability system of the Vetro Artistico® Murano trademark helps to identify the glass product, allowing the customer to have a guarantee regarding the origin and the authenticity of the glass object through descriptions, images and video. 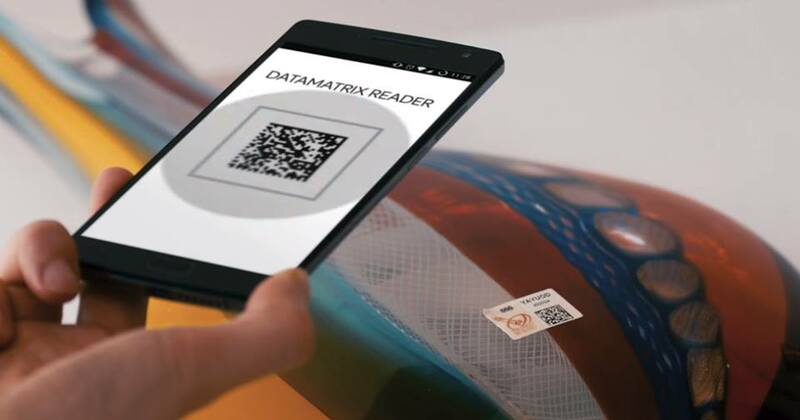 The Vetro Artistico® Murano trademark sticker has been developed with the most modern technologies and it will give the consumer the opportunity to track the entire product’s history, through the use of a smartphone. It is a true ID card of the glass work and a guarantee for the customer regarding its origin, uniqueness and the value of its creative process. It is an excellent way to fight forgery issues. The new traceable Vetro Artistico® Murano trademark sticker, in substitution of the old one, is born after long research and includes 5 different anti-forgery and security systems: Clear to Cyan® , Confirm®, Red and Blue Fluo UV ink, Gold Foil Printing, Security Cuts and 3 systems of traceability: product serial number, company identification number, Data Matrix.